root vegetables, overripe fruit such as kiwi, apricot, pineapple etc. The Koju juicer is a simple appliance which uses a hand-cranked auger to process produce through a fine screen. The advantage of this juicer is that it produces a very fine juice with a minimum of pulp. 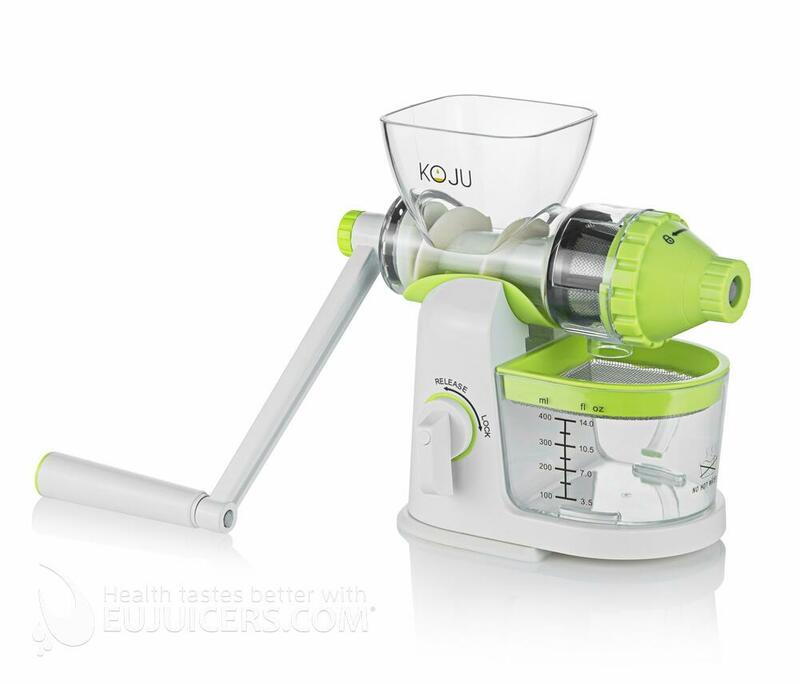 The Kojo juicer is designed mainly for leafy greens, herbs, and wheatgrass, but it can also process firm citrus or apples. However, it isn’t suitable for root vegetables or soft fruits like pears, ripe apples, berries, apricots, etc. The juice flows out a hole located on the bottom of the extraction chamber. 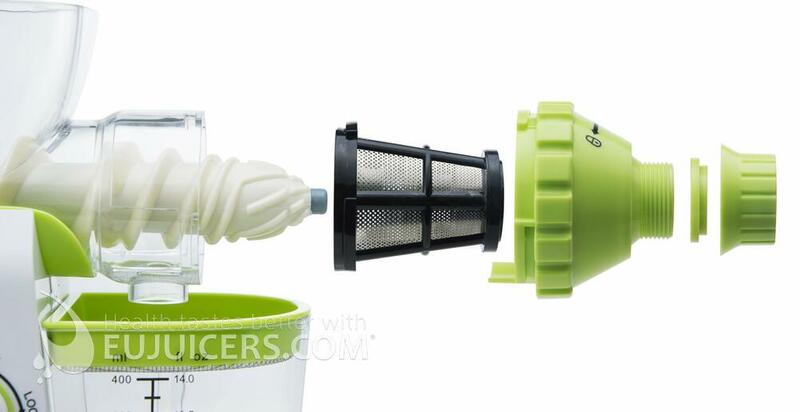 A strainer that fits on top of the juice bowl is included, and this filters out any last bits of pulp. The Koju comes with two different pulp nozzles which allow for greater juice extraction depending on the produce being juiced. For leafy greens and grasses, the small nozzle creates higher pressure giving better results, while the larger nozzle is suitable for citrus and firm apples. Cleaning is fast and simple. The auger is removed and all parts are rinsed with warm water. 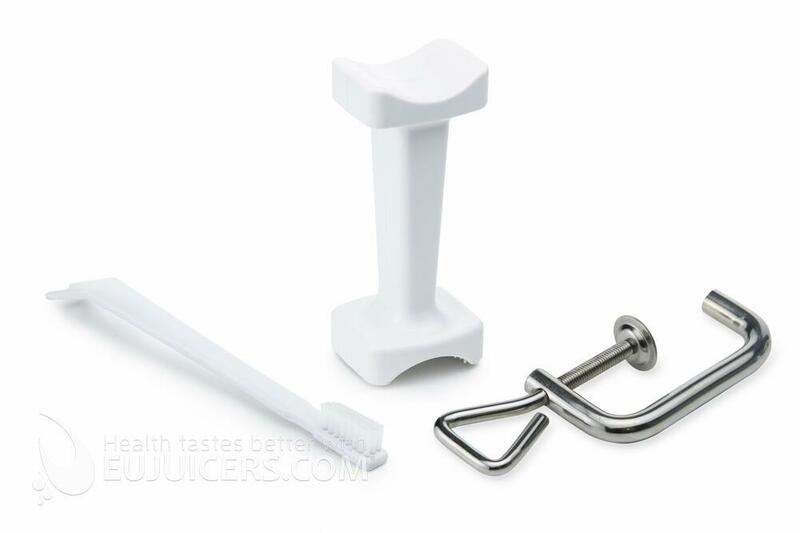 A brush is included for cleaning the juicing screen. 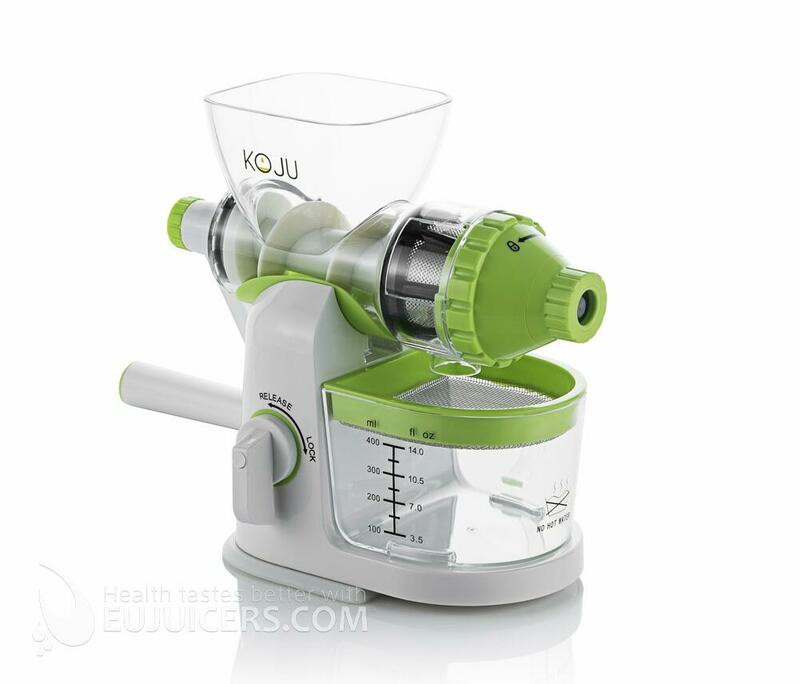 The hand-operated Koju Juicer is an affordable juicer that makes a great complement to centrifugal juicers which aren’t suitable for wheatgrass and leafy greens. It is also a great choice if you want an inexpensive way to test the effects of drinking fresh juicers, but aren’t ready to invest in a more expensive motorized auger juicer. We were happy with the Koju’s performance with leafy greens and wheatgrass. Since it is a smaller juicer, it is best to chop up citrus and apples into small pieces for best results. The Koju isn’t suitable for root vegetables like carrots and beets. Mounting is simple and the Koju stays firmly in position. The crank is made of cast iron, so it should hold up well under everyday use. With its compact size and light weight, the Koju is portable and makes a great travel companion.